Rumors of Foursquare’s acquisition may be greatly exaggerated. 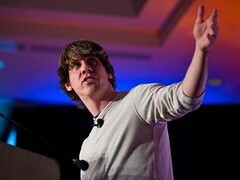 Speaking in New York on Monday at Startup 2010, Foursquare founder Dennis Crowley was busy making the case for his company staying independent. Will the company sell in the near future? It’s unclear. But to hear Crowley tell it, Foursquare doesn’t particularly need a large organization to keep it afloat. In fact, he seems to think Foursquare would be better off not selling. The site is getting about 600,000 check-ins per day. To keep up, rumors are flying that Foursquare will take a large cash infusion. Or more drastically — sell to a high bidder, like Facebook or Yahoo. Crowley admits that his company doesn’t have the luxury of having its network down for days, which is one growing pain that Twitter suffered at its inception. “We’re not going to be the only check-in service in town. “We have this trophy case, people are comparing themselves against each other. A site like Facebook (or Crowley’s former employer Google) has more leverage — and a higher change of getting check-ins right. But Crowley thinks Foursquare’s benefit lies in specialization. Even if it buys a company that specializes in the area? That seems to be Crowley’s point. If a site like Facebook succeeded with check-ins, Crowley thinks it could confuse users, and dilute the product. We’ll have to wait and see if Crowley holds behind that stance with the impressive monetary offers that are currently rumored to be on the table. But other small social media entities have avoided acquisition and lived to tell the tale. Twitter dominates micoblogging today, even though four years into its existence, Twitter is still a company in search of a business model.